$100 per day, $70 concession/student, $135 professional development (with certificate). $20 evening sessions, $15 concession. Payment on entry (no online booking for evenings). Earlybird discount 20% for standard and concession tickets before 23 February 2019. Book here. For full information, click here | see the flyer | rasp@divinity.edu.au | 03 9853 3177. 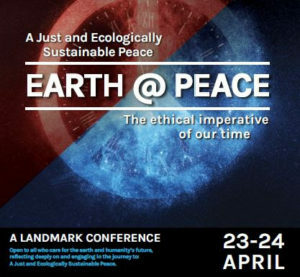 Interviews and panel discussions with leading thinkers, including working groups, and a discussion in ‘hypothetical’ format with 12 leaders and experts on implications of Australia attempting to apply the principles of a just and ecologically sustainable peace. Professor Heather Eaton St Paul University Ottawa Canada. Author of This sacred earth at the nexus of religion, ecology, & politics. Professor Bruce Pascoe Jumbunna Institute for Indigenous Education and Research University of Technology Sydney. Author of Dark Emu: Black Seeds: agriculture or accident, NSW Premier’s 2016 Book of the Year. Professor Chaiwat Satha-Anand Thammasat University Bangkok. Leading Islamic scholar and advocate of non-violence. Sponsored by University of Divinity Centre for Research in Religion & Social Policy (RASP), Pax Christi, Australian Research Theology Foundation, Ethos Centre for Christianity & Society, and Social Policy Connections.